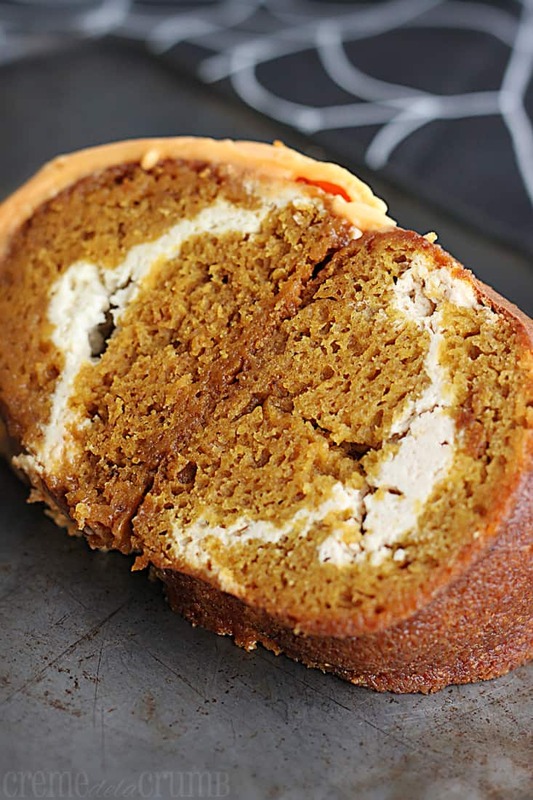 Pumpkin Cream Cheese Bundt Cake – The absolute perfect centerpiece and hit dessert item for your holiday party this season! Sometimes I think I’ve had a stroke of brilliance but then I find out I am not actually quite as brilliant as I thought. I told my mother I was making a cake. 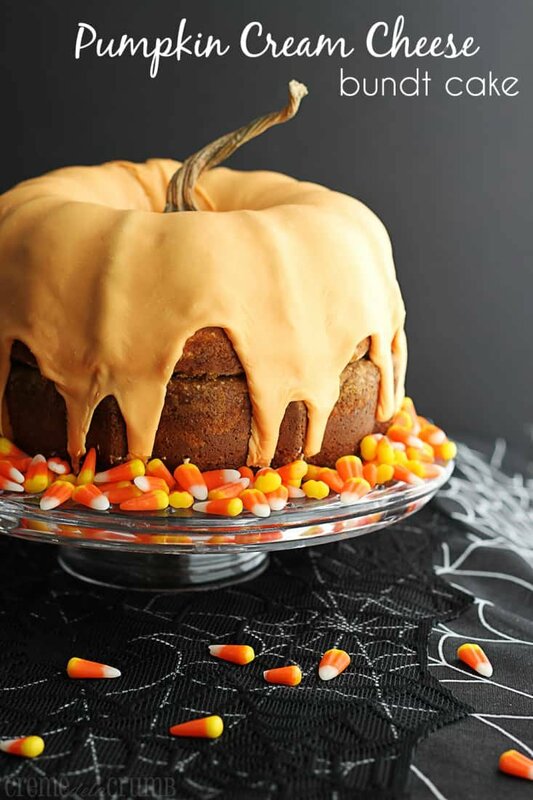 A pumpkin cake. No, a real pumpkin cake. 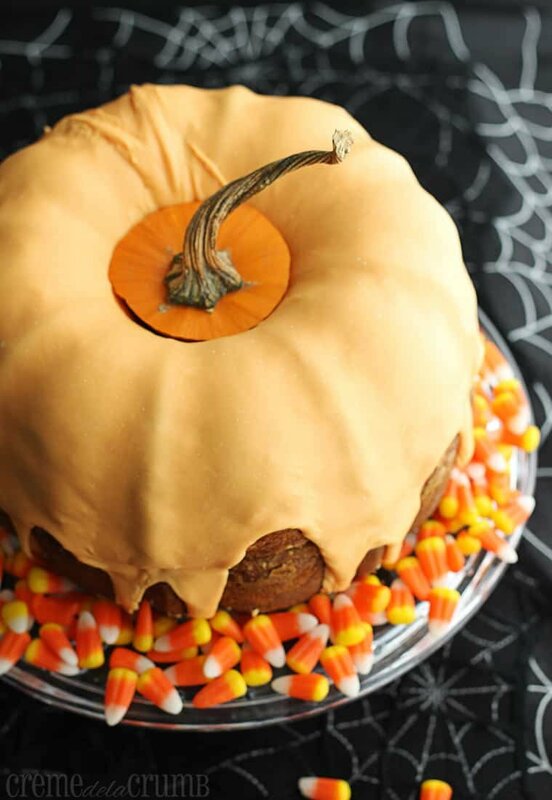 A cake that actually looks like a pumpkin. But still tastes like cake. Pumpkin cake. Well then my mother says to me, “oh that reminds me, did I show you that cake I found that I thought you should make? ?” No mother you did not. “Oh well let me show you!” she says. I guess I’m not so genius. Or I am, but someone else was genius before me. Maybe you have made a pumpkin cake that looks like a pumpkin before and you’re thinking right now, okay seriously, been there done that. I’m sorry. Please forgive me for borrowing your genius. Regardless of the fact that this cake is not wholly original and I’m sure you may find other like it on Pinterest, the point is that I made this cake and it was delicious and beautiful and now I’m going to share it with you. And by the way, all of my non-Pinteresty party attendees were absolutely wowed by this cake. They truly thought it was genius. And my more Pinterest-savvy attendees still adored it, even if they did throw in a “oh how cute, I saw that on Pinterest!”. Sometimes it isn’t about being the first ever to do something. Sometimes it’s just about doing it at all. Early or late, doesn’t matter. I made this cake and I loved it, and I’m pretty sure you will too! The absolute perfect centerpiece and hit dessert for your holiday party this season! Preheat oven to 350. Grease a round bundt pan and set aside. In a large bowl combine cake mix, baking soda, ginger, cinnamon, cloves, and sugar and whisk to mix well. Mix in eggs, pumpkin, and vanilla. In another bowl beat cream cheese, sugar, and egg until creamy. Mix in cinnamon and vanilla. Pour half of cake batter into prepared bundt pan. Add cream cheese and sugar to a medium sized bowl. Cream together until combined. Add egg, cinnamon, and vanilla and mix well. Spread cream cheese mixture on top of the pumpkin batter in cake pan. Top with remaining cake batter. Bake 50-60 minutes or until inserted knife comes out mostly clean. Mix together powdered sugar and milk in a microwave safe bowl. Stir in 1/2 teaspoon yellow food coloring. Add red coloring 2-3 drops at a time until icing is the desired shade of orange. Warm icing in microwave (20-30 seconds) until pourable consistency is reached. Pour icing over cake. Allow to cool and set. Top with optional pumpkin stem. Slice and serve at room temperature. **To make full pumpkin, you will need to make the above cake twice. Do not double the recipe and split between two cake pans. Make the cake two times. Flip one cake upside down, set second cake on top. Ha! Oh boy. And this is why you don’t blog at 3 in the morning. 😉 Thanks Deb!!! Is that 5 – 6 Tablespoons or teaspoons of milk for the icing? 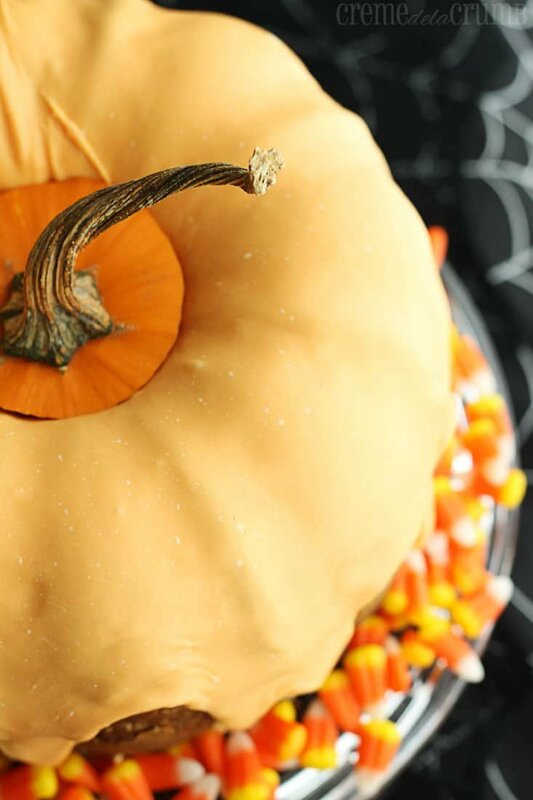 Maybe I am blind….but where does the actual PUMPKIN go into the cake? I assume it is with the batter/cake mix? Do you make both cakes in a Bundt pan or is one of the cakes prepared in a round cake pan? If both are made in a Bundt pan, do you slice of the ’rounded’ part on the bottom cake to get them to stack correctly? This is amazing!!! I am going to make this for Thanksgiving! Is the amounts for the icing enough to cover the cake? 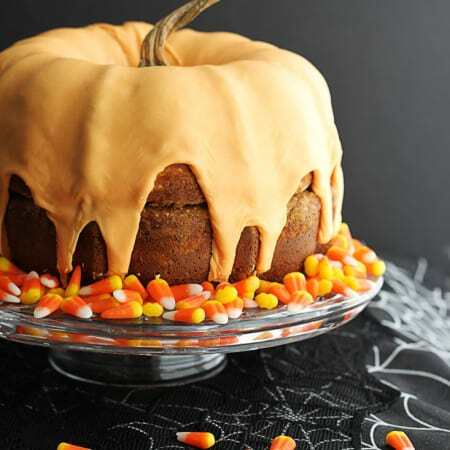 Or does it need to be doubled since you have to make the cake twice to achieve the pumpkin look. Hi Michelle! The recipe for the icing will give you enough to cover the top and drip down the sides, like you see in the pictures. If you want the whole thing completely covered in the icing, then double the ingredients listed in the recipe. I hope you enjoy it!! When I saw your recipe on pinterest, I could not stop thinking about it all week. Back in my college and the few years after during the fall I would stop into Starbucks for one of their pumpkin cream cheese muffins. I currently live about 2 hours away from the nearest Starbucks. Of the many recipes I have pinned and found on pinterest, this is the only one that I could not get out of my head. I have a mum flower bundt pan which is going to be the shape of mine. Thank you so much for sharing your recipe, and thank you so much for having a wonderful layout for printing. Should I double the icing recipe as well? Or will the ingredients listed be enough to cover both bundt cakes? This is just soooo lovely! I do use spreadable cream cheese in some of my recipes as a substitute for block cream cheese and it works well with some, and no so well with others. I haven’t tried it with this recipe so I can’t say for sure but I would suggest using block style cream cheese if at all possible! Smiling! I found your cake when I entered what I HOPED was an original idea into my search engine. Sigh. But you’re right – it doesn’t matter if someone has done it before. Yours is still yours, and probably a little different. This is a positively lovely cake. I assume ground ginger and not fresh? I can’t wait to make this!!! Does this need to be refrigerated because of the cream cheese or is it ok to leave out since it is baked? I made this for Thanksgiving this weekend and it was delicious! The icing was a bit thin – not sure why as I followed the directions. I put a bit of butter in it to thicken it up and it’s really sweet so I could have halved the icing recipe for my purposes. It was a BIG hit and everyone loved it….pretty straightforward to make and would definitely make this again. Thanks for sharing it! Made this for my son’s birthday (as a single cake) but frosted with a butter cream frosting with Bailey’s caramel irish cream for an added kick. It was fabulous! This is a delicious moist cake. Thanks for the pin. This recipe was fabulous!!!!!!!!!!!!!!!!!!!!!!!!!! The moistest cake I have ever had. I agree. The important thing is “doing it at all”. Your cake looks beautiful! Do you need to use the entire 1 cup of sugar? With the cake mix I wouldn’t think you would need added sugar. Hi Megan, I haven’t tried this recipe without the added sugar, if you do please let me know how it turns out! Is the 1 3/4c pumpkin spiced canned pumpkin or fresh pumpkin? What a hit this would be in my household! Yes! Wrap it in plastic wrap and keep it in the fridge up to a day ahead! Looks great! Can you clarify for me why the instructions demand two cakes (sequentially) rather than doubling the recipe and baking in two pans? Seems like an unnecessary doubling of the time it takes to complete the cake. Any light you could shed on this would be appreciated. Cheers! Hi Mimi, sometimes doubling recipes can affect the outcome negatively. If you do try it let me know how it goes, I can’t vouch for it myself as I’ve only made two cakes here, thanks! HI! Do I put the cream cheese filling in both cakes? Pumpkin cake, ??? Do I add the water and the oil on cake mix box? I know this is an older recipe, but what size yellow cake mix did you use? They have shrunk over the years due to companies giving us less for same price. Old size was 18.5 ounces, now they are down to 14-15 ounces! Screws up lots of recipes based on a certain size mix. Felt I must ask before trying this great looking recipe! Your cake looks really really good. I also wanted to make this shape cake and I was looking for the recipe for the cake strong enough to hold the weight. And I am a little bit disappointed that your recipe it is actually a ready mix. Sorry, but this is not a recipe in this case. Also there is no information how big form is for this amount of batter. All the information needed for make a good cake if you are not a master in the kitchen and you are looking for help from people doing this better than me. I made this for my daughter’s October birthday. What an amazing cake! Loved by kids and adults, will make again! This cake was delicious and I received raves. So moist. I will try to add a little less sugar in the cake batter next time. Pure pumpkin- not pie filling.